Nutriboss Blender – Is is perfect for healthy drinks? Does the Nutriboss Blender Really Work? Most everyone has some type of blender in their home, but perhaps the Nutriboss Blender is going to make them look obsolete. The big feature of the Nutriboss Blender is the fact that you don’t need to add any liquids to your fruits and vegetables that you want to turn into a healthy drink. So you are getting a more concentrated version of your food and drinks, instead of them being watered down which can happen with traditional blenders. It has two serrated edges for chopping and four very sharp edges for slicing. 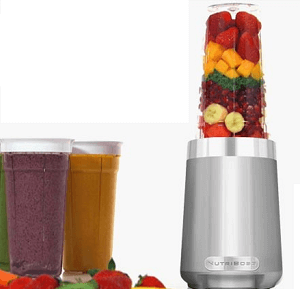 The Company is claiming that the Nutriboss Blender has the capability to completely liquify fruit and vegetables. It is claiming it has all the features necessary for making healthier smoothies and shakes because of its ability to completely liquify. Nutriboss Blender is being hyped because of its ability to create what the promoters consider as a healthier form of blended food because of its liquifying capabilities. Their marketing approach is focusing on how healthy the drinks are for you that you will be able to make with the Nutriboss Blender, and are using this as their selling feature. As with any small kitchen appliance or gadget you are going to have to commit to using it. It means buying and preparing the fruits and veggies that you are going to use for your healthy drinks. Then of course you have the clean up of the Nutriboss afterwards. The Company has put all of its hype on the end product that the unit makes, and doesn’t mention how easy or difficult it is to clean the Nutriboss Blender. For those that are really into their health food drinks that the Nutriboss Blender probably is a good choice. It seems to be compact yet powerful enough to liquify the foods that are normally used in the various healthy drinks. Keep in mind though that this particular blender is designed to liquify foods. You are not getting the same choice of speeds or settings that you may find on other blenders. So when making your decision about buying a blender you want to know what you are going to require of it. We’re going to give the Nutriboss Blender a Thumbs Up Rating for a few reasons. We like the convenience of it, especially for the morning time when you want to give the family a healthy start to the day. If you prepare the fruits and veggies the night before, then they are ready to pop into this blender in the morning. The kids can take their ready made drinks with them. We have done a fair number of reviews on other types of blenders in the past and they always seem to be an important item to have in the kitchen. One that has received some good reviews that we talked about is the Nutribullet. What do you think? Does the Nutriboss Blender work or not? Does the Xpress Redi Set Go Really Work? Does the Cuisinart Griddler Really Work?